After apples last month it is pumpkin season now…well, at least in my kitchen! Last weekend I roasted our ‘Halloween decoration’ pumpkins. Roasted, Pureed and Packed (in freezer pouches). In case you are wondering, it is actually fairly simple to roast and puree a pumpkin. The only hard part is to cut it initially since the skin is really very hard. But if you get a good large knife and make that initial cut to get past the thick outer covering, then its easy to cut it all the way through. All you need to do is to cut it into 3 or 4 smaller pieces. Lay them on a tray face down and roast for about 45 minutes or so. I roasted them at 400 F and you can use between 350 and 400 F and it comes out fine. Once the outer skin looks soft and insides also look soft, get them out and after cooling scrape the insides – all the seeds with the fibrous flesh. You can reserve the seeds for roasting them separately and boy are they delicious too! Puree the rest of the pumpkin in a blender after removing the skin. I like to freeze in 3-4 freezer bags so that I can use as needed. You can use this to make any recipe which asks for canned pumpkin puree. Pumpkin chutney (yum! ) , pumpkin donut holes and this pumpkin bread with cream cheese filling are the favorites in our house 🙂 . Last weekend I was in the mood to make Pumpkin donuts -I had pinned a couple recipes! But I couldn’t find a donut pan for baking the donuts at any store. So have ordered online now and while I am waiting for that to come, the kids could definitely use something else pumpkiny and so I decided to bake muffins instead of pumpkin bread and also decided to sneak in carrots this time into my recipe! 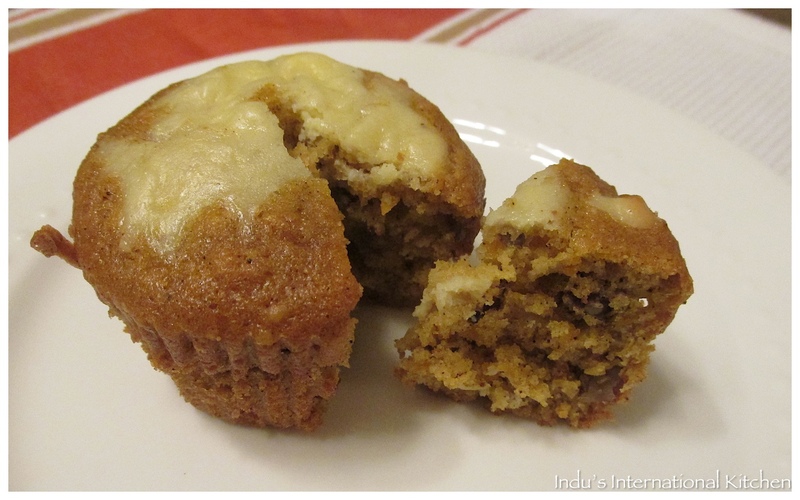 The result – lovely muffins with perfect moist texture and the kids did not even guess the carrots! So I added one more healthy ingredient now to my staple pumpkin bread recipe! Looks like every year I add something healthy to it – Last year I substituted part of the flour with whole wheat flour and the year before that i replaced butter with olive oil! This time because of the carrot addition i also reduced the amount of sugar too! How wonderful ! So the final end product – one healthy muffin – whole wheat,no butter and with healthy wholesome ingredients like pumpkin,carrots and walnuts! Now those are multiple reasons to indulge 🙂 Of course you can totally skip the cream cheese part too and keep it really low calories but I cannot – my kids will kill me!!! Preheat oven to 325 deg F. Lightly grease your pan and set aside. In a medium size mixing bowl, combine all the filling ingredients and beat using a hand mixer until smooth and creamy. Keep this aside. In another larger mixing bowl, add the pumpkin puree, the carrots, the oil, the eggs and the sugar and mix well using a hand mixer. Mix all the dry ingredients separately in a tray or a plate or just wax paper. Now add the dry ingredients slowly little bit at a time into the mixing bowl with the pumpkin mixture. Once all the dry ingredients are incorporated, add the chopped walnuts and at this point turn the mixer off and mix by a spoon. Now pour the batter onto the muffin pans. Then add the cream cheese layer on top. I love that you used home-made pumpkin puree, these look delicious! Ooooo Mmmmmm G! Amazing. I have been doing a round up of all things pumpkin in recent weeks, these are totally now on the list. Yarm! Especially love the cream cheese, how could you skip that. LOL! thanks Anna. Yes yum! ha ha ur just like my children about the cream cheese! 🙂 Btw did u do a round up post on all pumpkin recipes? I couldn’t find it on ur site?